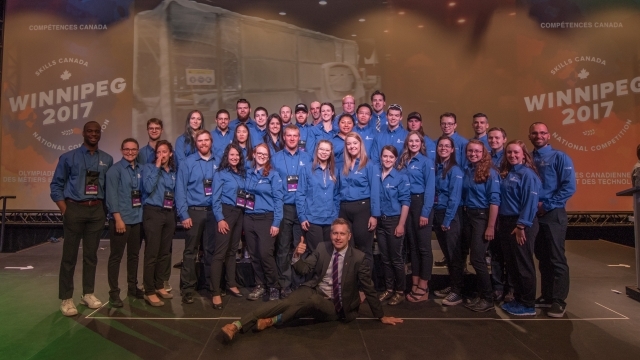 At the 2016 Skills Canada National Competition (SCNC) in Moncton, NB, the Essential Skills Youth Forum recommended the development of a national alumni program for previous national and international competitors. To celebrate Canada’s 150th birthday, Skills/Competences Canada (SCC) worked with its Skills Canada Member Organizations to select approximately 40 Alumni ‘Champions’ to highlight at the 2017 Skills Canada National Competition. These Champions have been selected by their Skills Canada Member Organization and have previously participated in provincial/territorial, national and in some cases international SCC activities or events. The Canada 150 Champions are here to tell their stories and engage with the over 10,000 student visitors expected during SCNC 2017. SCC works actively to promote careers in skilled trades and technologies to Canadian youth. One of the many ways we do this is through the competition process and the hands on activities that are provided for student visitors during the two days of competition. Communicated with teachers and school administrators as to how they can help students reach their personal goals as mentors and advisors. SCC was pleased to welcome the Canada 150 Champions to the 2017 National Competition. Our goal was to have these Champions communicate their success stories, and share their experience, to encourage and inspire students to follow a similar path and choose a career in the skilled trade or technology sector that’s of interest to them.